I like an occasional jello on my dinner plate. I like jello with fruit, cottage cheese, shredded carrots, whipped cream, you name it. One of my very jellos I've had lately is this creation. My sister-in-law makes it whenever my family has a get-together and food is involved. We all eagerly anticipate her jello reveal. When it is my turn at the buffet, I know I can't take the amount of her jello that I really want because there are lots of people who want a taste. So, I emailed her for a copy of her recipe and she graciously sent it the same day. I made it for Easter and topped it with freshly whipped cream...come to think of it, it's more of a dessert than a side dish. Shh...I won't tell anyone. It's citrus-y and creamy and fruity and delicious. Please remember I'm using my point and shoot 'cuz my Cannon is still at the camera doctor. or, heaven forbid, 8 oz. container cool whip. Prepare lemon pudding according to directions on the box. Cover with Saran Wrap and set aside to cool to room temperature. 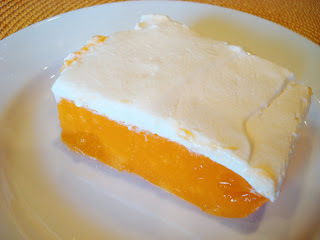 Prepare orange jello according to directions on the box BUT use only 1 1/2 cups of cold water. Cool to room temperature. In a large bowl, pour pudding and jello liquid together. Whisk until smooth. Add fruit if desired. Pour int a 9x13 inch pan and let set up over night. Spread shipping cream over the top just before serving. Yum. 0 Response to "Citrus Jell-O"